Pediatric Dentistry of Ft. Myers, Dr. Tim Verwest, DMD will host an inaugural community fundraiser ‘Snow Day 2015’ on October 3, from 11:00 AM to 2:00 PM. The festivities include holiday pictures with Anna and Elsa along with Olaf from the movie Frozen. There will be snow special effects, NBC2 Chief Meteorologist Haley Webb will help predict the forecast for snow, 96.9 More FM live broadcast and music by the South Fort Myers High School Band, face painting, bounce houses and slide. Meet various mascots including Swampee from the Florida Everblades, Miss-A-Miracle from the Fort Myers Miracle, the Chick-Fil-A cow, and a Minion, courtesy of Jumping Jacks Fun Zone. View Frozen artwork courtesy of Painting with a Twist and create kid friendly crafts in Santa’s workshop. “This is a unique events for frozen fans, Jeffrey Shafer our Marketing Director did a great job gathering top anchors in the community,” said Dr. Tim Verwest, DMD. “If you want to have great holiday pictures to look back on come to Snow Day 2015”. Prices are $5 for adult entry and $10 for all-day wristband for children (unlimited access to bounce house play, face painting, and VIP pictures with Anna, Elsa and Olaf). You may purchase tickets in advance by visiting http://goo.gl/cbCqi8. Food will be available and provided by BurgerQue, The Sizzle Truck, Doner Kebeb King Karl, and Poutine Queen at an additional charge. 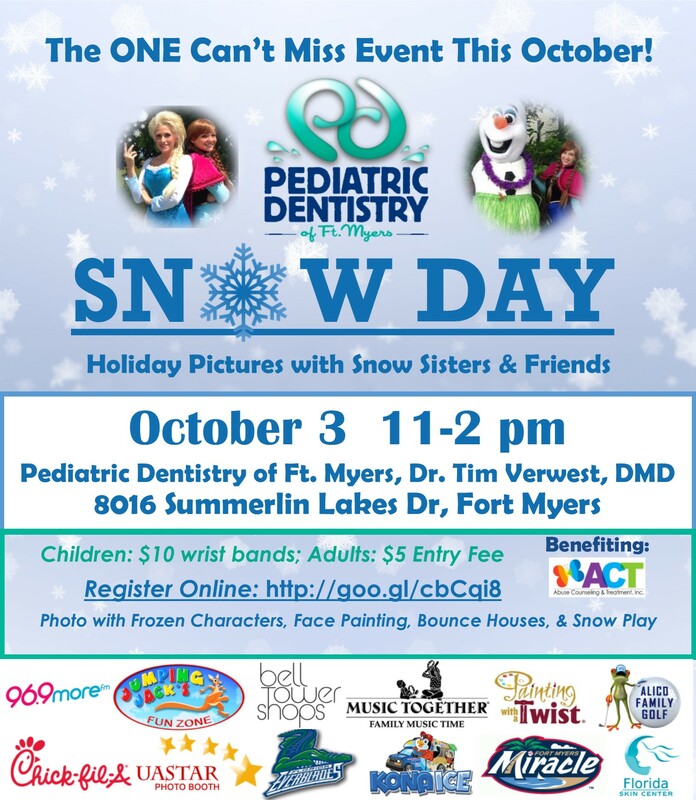 Snow Day 2015 is located at 8016 Summerlin Lakes Dr, Fort Myers, FL 33907.All proceeds from Pediatric Dentistry of Ft. Myers Inaugural Snow Day 2015 will benefit the Abuse Counseling Treatment, Inc. (ACT).